Diary of A.J. 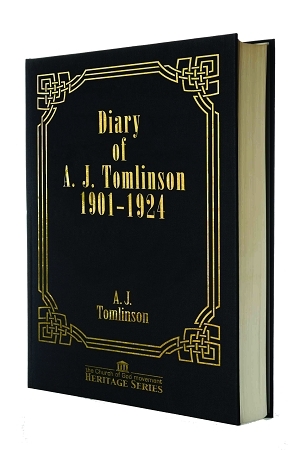 Tomlinson 1901-1924 is the 5th book in the Heritage Series. It is taken directly from Tomlinson's handwritten diary. It gives great insight into the beginnings of the Church of God and, eventually, the Church of God of Prophecy, from the man who was at the forefront of the movement. The Heritage Series is designed to be an aesthetically pleasing set that can be proudly display in your home, office, or church. Each book is produced with a high-quality hardcover and gold-foil stamping. Each volume is numbered with matching colors and dimensions to make the collection stand out on your bookshelf.